Hubby and I grabbed two tickets for ourselves when Cebu Pacific Airline offered a P1.00 seat sale last February 2007 to Singapore and the departure was on June 2007. The roundtrip ticket cost us only around Php 4,481.00 per person (including the Php 1,620.00 travel tax). Lucky us! 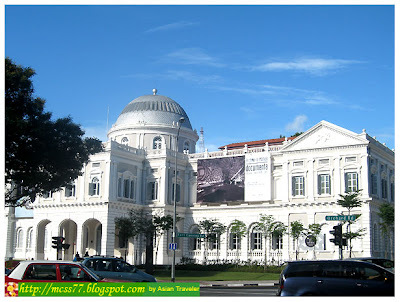 First thing that I noticed about Singapore, is the vibrancy, cleanliness and remarkable colonial architecture. It is very safe, well-organized and systematic. This place may be relatively small but a very modern westernized Asian city. There are lots of shops for great shopping bargain, skycrapers, subways, 24-hour hawker centers with tasty food and a vibrant nightlife scene. The mobility of generated traffic has a relatively light flow. 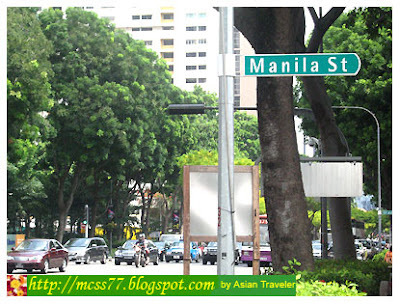 What a concidence, while walking along a wide avenue of Singapore we saw a street named "Manila". During our stay, we visited other places of interest such as Singapore Zoo, Night Safari, Sentosa, Orchard Road, Esplanade Mall, Vivo City, Suntec City Mall, Bugis Market, Lucky Plaza, etc. And what was remarkable, we were there during the Great Singapore Sale (May 25 - July 22), we took advantage of it and had a frenzy bargain hunting especially at Mustafa Center. Singapore is an island-state in Southeast Asia, connected by bridges to Malaysia. Founded as a British trading colony in 1819, since independence it has become one of the world's most prosperous countries with a medley of Chinese, Indian and Malay influences. It has a tropical, hot and humid climate. Temperatures average 23-30°C with heavy rainfall from November to January. Getting around in Singapore is easy. Excellent bus services complement one of the most modern and efficient Mass Rapid Transit (MRT) systems in the world. It has stations all over the city and operate from 5:30 am until midnight daily. The ez-link farecard (a stored value card) can be purchased at most MRT stations and is also valid on public buses. The island's plentiful taxis are metered and air-conditioned. Self-drive and chauffer-driven cars are can be hired from a number of operators. Singapore's government is strict on drug laws, with the death penalty applied for drug trafficking. It is also against the entry of firearms, controlled drugs, endangered species of wildlife, chewing gum and cigarette lighters in the shape of a firearm. Spitting in public places is an offence. Smoking is prohibited in public areas but it is permissible at pubs, discos and lounges. Tipping is prohibited at the airport and discouraged at hotels and restaurants where there is a 10% service charge. Visitors entering Singapore must have passports valid for six months from the time of their arrival. Visas are not required for stays of up to two weeks for Commonwealth citizens, British passport holders, and citizens of the Republic of Ireland. The local currency is Singapore dollars and cents (currency code SGD), abbreviated with S$. Banking hours are Monday to Friday: 10 am to 3 pm, and Saturday: 9.30 am to 1 PM (some banks are open until 3 PM). Sunday, 9.30 am to 3 PM (some banks in Orchard Road). Most banks handle travelers' cheques and change foreign currencies. However, some banks do not have foreign exchange dealings on Saturday. Passports are required when cashing travelers' cheques. A nominal commission may be charged. Dressing: Dress appropriately (arms and legs should be covered) when visiting temples and mosques. Removal of shoes: Visitors are required to remove their shoes when visiting Indian temples and mosques. Shoes are also often removed before entering local homes. Use of hands to eat or pass food: Always remember to use your right hand when eating an Indian / Malay meal. When having a Chinese meal: Never stick your chopsticks into your food. If you need to rest your chopsticks, leave them on the chopstick rest or by the side of your plate or bowl. If the table setting includes two spoons, remember to use the Chinese porcelain spoon for eating and the silver one (usually with a longer handle) to dish out food only.